Elionurus hirsutus Forssk., Lasiurus hirsutus auct., Rottboellia hirsuta auct. (USDA, 2010). The species scindicus is often spelled sindicus (Quattrocchi, 2006). Sewan grass (Lasiurus scindicus Henrard) is a perennial grass that can live up to 20 years. It is a bushy, multi-branched desert grass with ascending to erect wiry stems, up to a height of 1-1.6 m, and a stout woody rhizome (FAO, 2010; Ecocrop, 2010). Leaves are alternate with a thin leaf-blade. The inflorescence is a silky, 10 cm long raceme bearing hairy spikelets. The fruit is a caryopsis (Anon., 2010; eFloras, 2010; FAO, 2010; Burkill, 1985). Sewan grass forms bushy thickets in sandy deserts where it is used for pasture, hay and fodder for livestock. This grazing pasture is of outmost importance in areas where annual rainfall is below 250 mm (Ecocrop, 2010). It is relished by ruminants but does not stand heavy grazing and disappears when overgrazed (El-Keblawy et al., 2009). Sewan grass is native to dry areas of North Africa, Sudanese and Sahelian regions, East Africa, and Asia. It is found between 25 and 27°N latitude in dry open plains, rocky ground and gravelly soils (Quattrocchi, 2006). Optimal growth conditions are annual rainfall below 250 mm on alluvial or light sandy soils with a pH of 8.5. It is highly tolerant of drought but should be protected from wind in the early stages of establishment (FAO, 2010). A 30-day cutting interval at a height of 15 cm gives the best dry matter yields. Sewan grass yields 2.7 to 10.5 t fresh forage/ha/year and up to 3.4 t DM/ha in well-established swards (FAO, 2010). These low yields can be improved by annual seeding of companion legumes such as guar bean (Cyamopsis tetrangonoloba) or mat bean (Vigna aconitifolia) (Göhl, 1982). Species like sewan grass are very important in arid environments because they provide forage, which maintains both wild mammals and livestock, and soil cover (Assaeed, 1997). Reseeding arid rangelands with species such as Lasurius scindicus, which are more palatable than native species, would improve the forage resource (Khan et al., 1999). 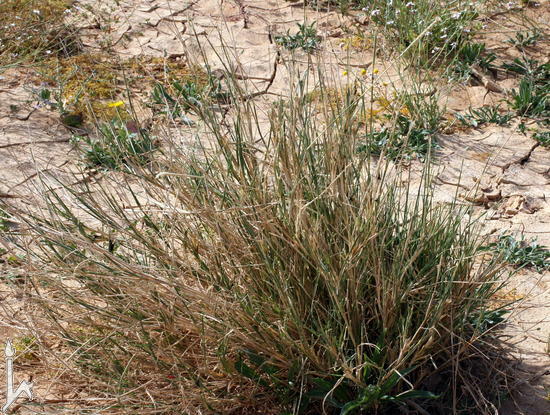 Sewan grass can be used to stabilize desert sandy dunes (Ecocrop, 2010; FAO, 2010). In deteriorated rangelands of Saudi Arabia, sewan grass helps to control the low value invasive species Rhazya stricta by smothering its seedlings. It is a useful tool to improve rangeland management (Assaeed et al., 2001). Sewan grass is one of the most important grazing grasses in North-West India (Rajasthan) and northern Pakistan in areas with less than 250 mm rainfall, where it is sown for permanent pasture (FAO, 2010). Sewan grass is mainly grazed by ruminants, generally in association with Cenchrus ciliaris and Cenchrus setigerus, which occupy the same agro-ecological niche, especially in Rajasthan and Pakistan (Bhati et al., 1983; Gupta et al., 1984; Khan et al., 1999). Its in vitro digestibility is lower than that of Cenchrus ciliaris (Saini et al., 2007). Live-weight gains in sheep and goats grazing sewan grass stands are greater during the early growing season due to the high nutritive value of the swards. During the dry period (May to June in Pakistan) goats and sheep lost weight (Khan et al., 1999). A long-term trial of 2 years in Rajasthan showed that ewes grazing a pasture containing 70% sewan grass needed to be supplemented in spring (dry season), but not in autumn (after the monsoon), to meet their lactation requirements (Thakur et al., 1987). Lebbeck (Albizia lebbeck) pods can be an efficient supplement for sheep fed degraded sewan pasture (Ram Ratan et al., 2005). Supplementation with crushed guar seeds (Cyamopsis tetragonoloba) at 150 g/head increased DM intake and diet digestibility in ewes grazing sewan grass (Thakur et al., 1985). Sewan grass is a palatable pasture for camels, but supplementation is required to meet their nutritional requirements (Nagpal et al., 1998; Nagpal et al., 2000; Nagpal et al., 2004). Overgrazing by camels of the arid rangelands of Saudi Arabia resulted in a reduction of sewan grass and other palatable species found in the stands (Shaltout et al., 1996 cited by El-Keblawy et al., 2009). Sewan grass hay can be successfully stored for up to ten years (Singh, 2008). Sewan grass hay is less digestible than buffel grass hay (Cenchrus ciliaris) (Paul et al., 1979; Sawal et al., 2009) due to its high lignin content (4 to 8% DM) and low nitrogen level (5 to 10% DM). Dry matter digestibility is usually poor (35 to 40%) (Bohra, 1982), but can reach 60% (Ram Ratan et al., 1973). Sewan grass hay cannot be used as sole source of nutrient supply to livestock and should be supplemented with local products such as guar seeds (Ram Ratan et al., 2003) or included in total mixed rations with groundnut hulls or straw, mesquite pods (Prosopis juliflora), deoiled rice bran, rocket oil cake (Eruca sativa) or colocynth seed cake (Citrullus colocynthis) to provide 13-14% CP in DM (Sharma et al., 2006). Mesquite pods, which are available in the same climatic conditions, have a high N content and availability and are useful for making sewan silage. A 50:50 mesquite pods-sewan grass silage provided 13% crude protein, without requiring the addition of urea or molasses in the diet (Pancholy et al., 1999). In arid regions of India, horses can be fed sewan grass hay as their basal roughage (Nehra et al., 2008).